There's 9 comments so far. Last comment was posted 10 hours, 37 minutes ago. 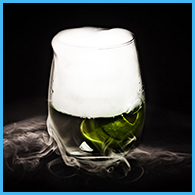 « Tiki Photo Contest – Last Chance! When I first dipped my paw into the world of cocktail blogs, pictures were a thing saved for books and the imagination. Now, it’s hard to find a post that doesn’t include a photograph. The quest for most has turned from simply including pictures to improving them and eeking out that last bit of mouthwatering pleasure from each shot. It just so happens that I have three copies of Sippin’ Safari to give away instead of two. All the entries were fun to see and really show promise for cocktail photography. Here are the winners! 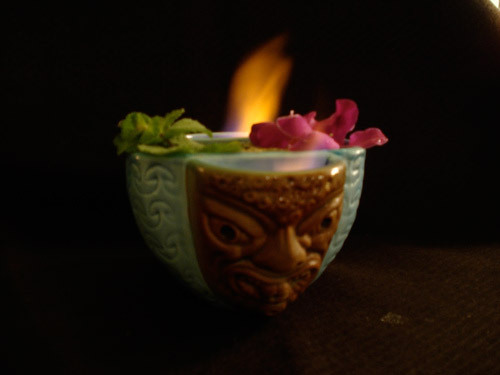 Chip and Andy sent over an enticing number of pictures, but my tiki spyglass quickly centered on the angry face with flames. It is very hard to shoot the mystical aura of fire, but this shot transports me back to a moodily-lit tiki bar – a place I’d love to be right now. Jimmy from over at Jimmy’s Cocktail Hour sent me this picture of his Mai Tai in a flurry of excitement. I love the retro colors; the shot reminds me of some of those in Sippin’ Safari and that is enough for me to give it a win. 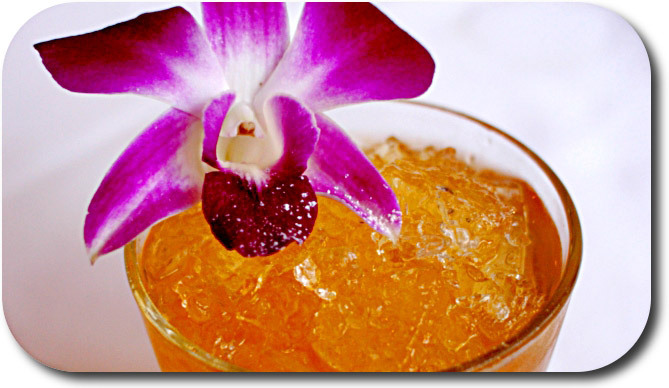 The color of the drink seems a bit over saturated, but the orchid is bright and inviting. 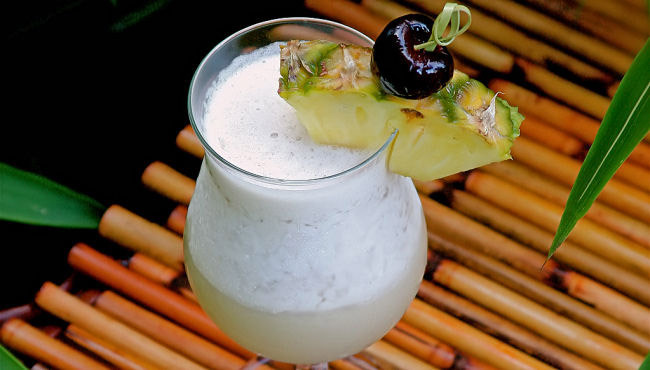 Anita from Married … with Dinner sent over this beautiful shot of a Pina Colada. I’m not a huge fan of frozen drinks, but her recipe actually sounds pretty good. The background elements perfectly match the cocktail and theme, and if I’m not mistaken, there’s a tasty-looking homemade maraschino cherry perched atop the garnish. Great job. And that’s probably you! What kept you from participating? Would you like to see another photo contest? Nice pictures. As for me I just seem so busy with stuff. When I do something, I want to do it right. So that usually requires and investment in time, which seems to be in short supply. But, definitely do another photo contest. Look at Mixology Monday, it started off with a handful of people and once had maybe four people participate. It’s grown, and so will your photo showdown. My lack of participation was due to the absence of a decent camera, which I’ve since corrected. So, I assure you my participation in another cocktail photo contest. I’d love to see it happen. Yay! I am happy to be included with two other great photos!! Thanks for running this contest. I don’t love blender drinks, either, but the pina colada just screams tiki for me, and the unblended versions just ain’t the same. I’m honored… I’m surprised….. I’m glad you liked the photos. The vessel in question is a Janus Mug from Spain, and the two side pockets are actually for a dry-ice fog effect. I didn’t have any dry-ice so I switched back to my favorite of Fire. Oooooh! I love Jimmy’s Mai Tai. 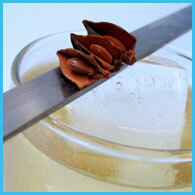 There is something about an orchid garnish, whether on a drink or food, that just lifts my spirits. I didn’t get anything in because I’m still working on a decent light box. I also found one ready to go, and have dropped a few hints that it would be a nice gift…. I have no real excuse for not participating beyond intrinsic laziness. Please do have another contest, and I will do my best to participate. Lack of money for/lack of ingredients for tiki drinks… the cramped confines of a dorm room and the lack of a proper light box or studio… You know, the usual. Nice shots though, everyone.